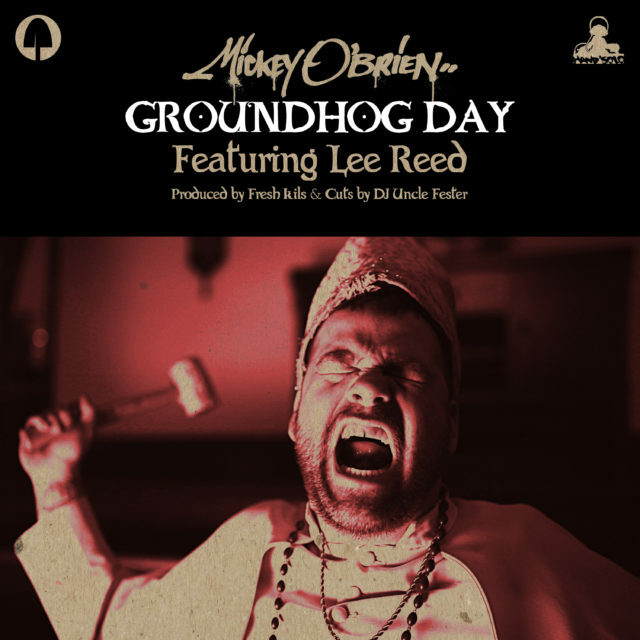 Mickey O’Brien’s My Drift drops on March 22, but the pre-order is now up with two songs to sample, including first single “Groundhog Day” featuring Lee Reed… The video should be ready soon. Mickey O’Brien aka OB OreBody was born and raised in Copper Cliff, Ontario in the shadow of the iconic Sudbury smelter. As such, his music represents the raw, unfiltered experience of the working class man in the modern world, expressed over a soundtrack of 90s era boom bap beats. 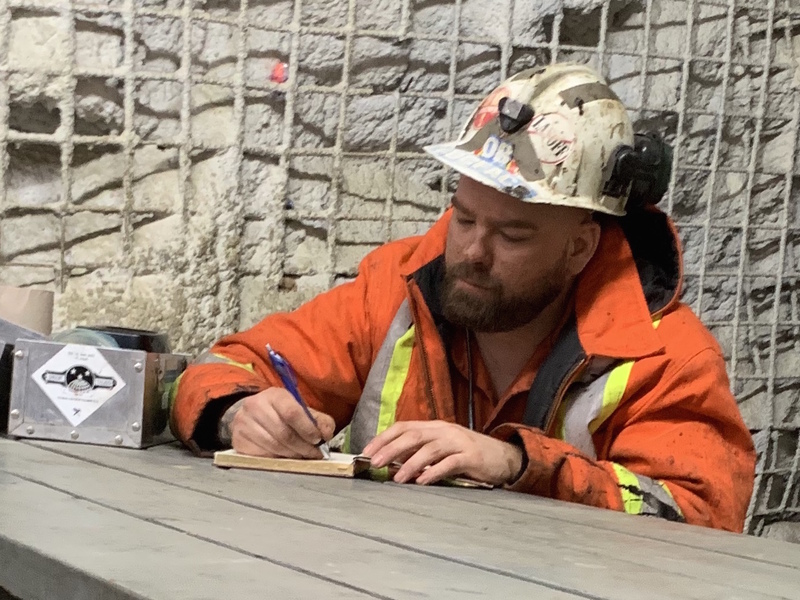 In fact, by day, Mickey O’Brien works as a hard rock miner, literally exploring the underground. But by day and night, he’s also an underground MC, simultaneously channeling a variety of influences and predecessors — Atmosphere, Eminem, Nas, and Jay-Z, to name a few — to deliver hard-hitting raps that touch on class struggle, love & loss, and the daily trials of life. My Drift, the debut album under the Mickey O’Brien monicker, departs from his more idealogical work as Kill the Autocrat, making the political personal by rooting it in his own life experience. Produced by Canadian beat-master and MPC button-masher Fresh Kils, with cuts contributed by DJ Uncle Fester, the two previously partnered as The Extremities. My Drift also features guest appearances from some of the most unique voices in Canadian hip hop: D-Sisive, Mindbender Supreme, More Or Les, The Mighty Rhino and Lee Reed, who appears on first single “Groundhog Day”. 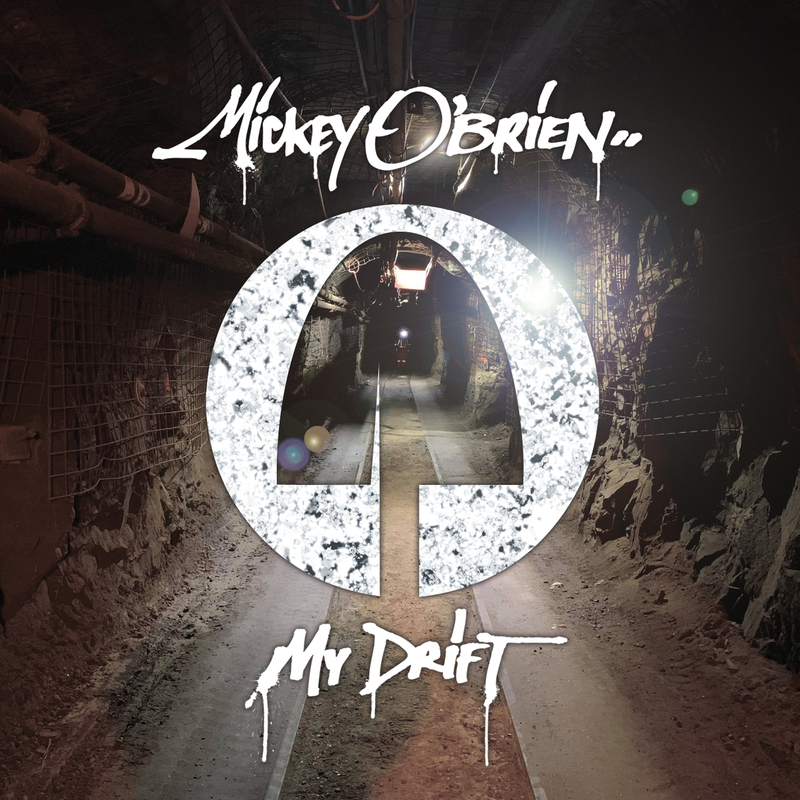 With “My Drift”, Mickey O’Brien shows that the genre can grow up and mature but that doesn’t mean it has to be any less gritty or abrasive. 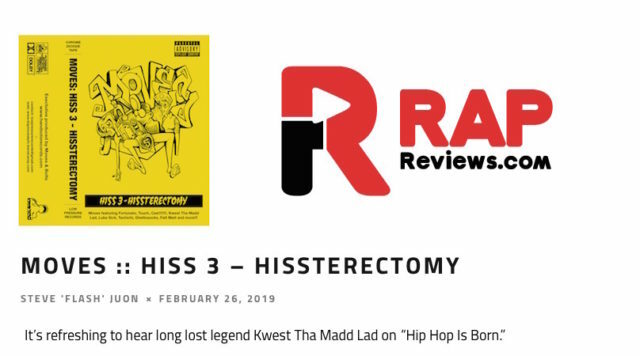 The first single from Hiss 3 – Hissterectomy is anchored by a dope line borrowed from diggity Das-EFX and a funky, 420-friendly bassline, both perfectly suited for guest rapper Touch to brag about his impressive weed intake. 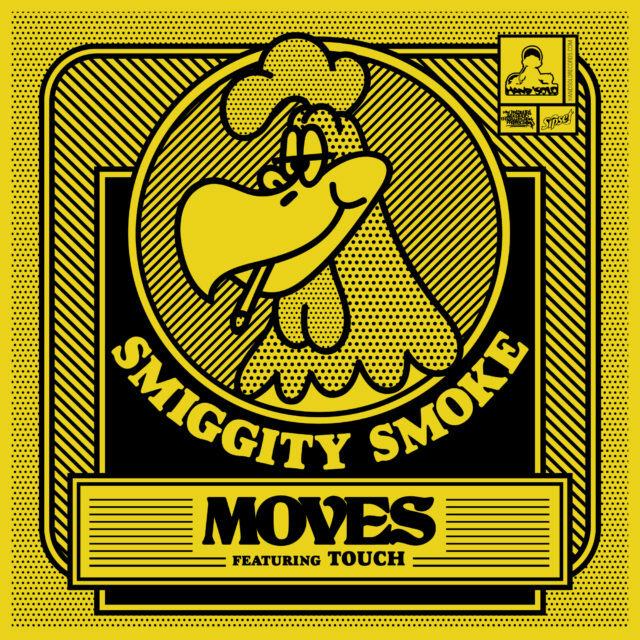 The “Smiggity Smoke” maxi-single/DJ Pack includes three remixes that take the vibe further afield, each also featuring a third verse otherwise exclusive to the extended version off the 7” from Black Buffalo Records. While Touch and The Dirty Sample venture into the outer limits with their weird and creepy remixes, DJ Matto ventures onto the dance floor with his dark and epic, synth-heavy remix. Take your pick of four varieties of “Smiggity Smoke” now available for your stoner pleasure! “Smiggity Smoke” is also available on 7″ from Black Buffalo Records featuring an extended version with an extra verse from Touch, with “Nightlife” featuring Fatt Matt on the flip side. 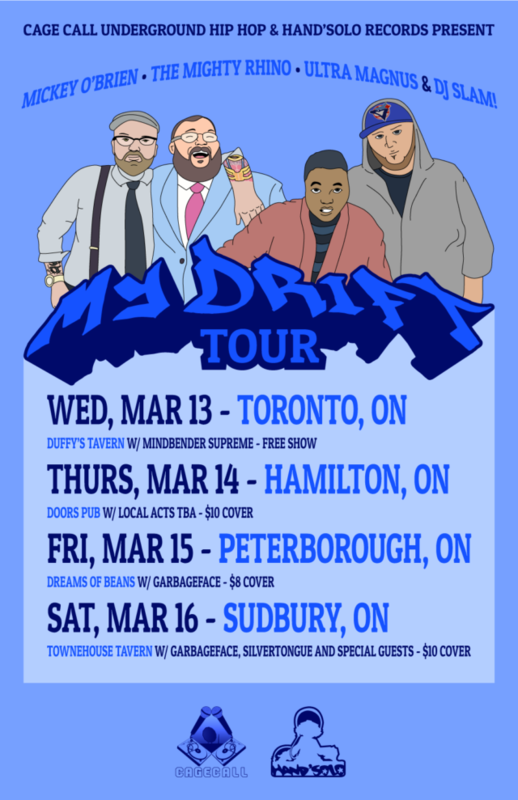 My Drift Tour with Mickey O’Brien, The Mighty Rhino, and Ultra Magnus & DJ SLAM! Mickey O’Brien celebrates the release of his new album, My Drift (Hand’Solo Records), with a short tour that starts in Toronto and hits Hamilton and Peterborough before finishing with a bang in Mickey’s hometown of Sudbury. 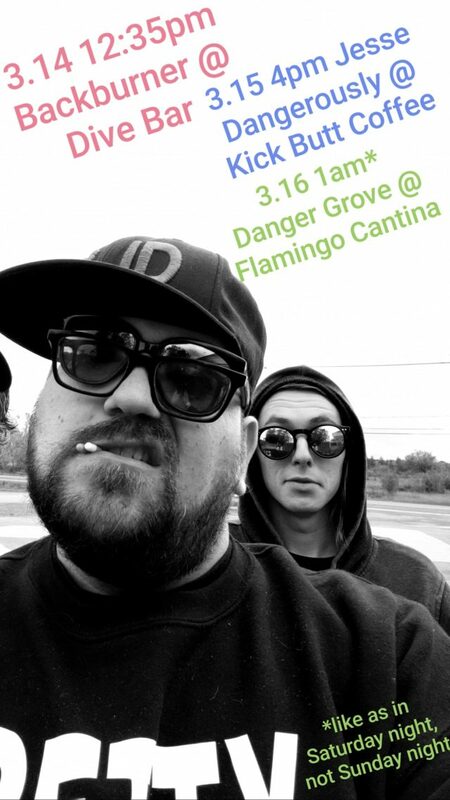 Accompanying him on tour are label mates The Mighty Rhino and Ultra Magnus & DJ Slam!